The RFID B1 is the second in a family of ISO14443A products. 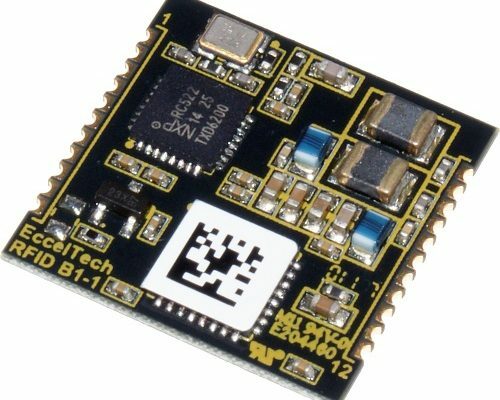 It is the smallest footprint module available and is in a surface mount package. Along with small size, lowest power and fastest performance with 128-bit user optional AES encryption security are the key features. The RFID-B1 also introduces a user asynchronous serial interface, for easy connection to most common microcontroller, plc and computer hosts. The device also offers ADC, DAC, PWM, comparator, voltage reference and temperature sensor. All of these peripherals along with communication to ISO14443A based transponders is provided by a simple but powerful set of commands.